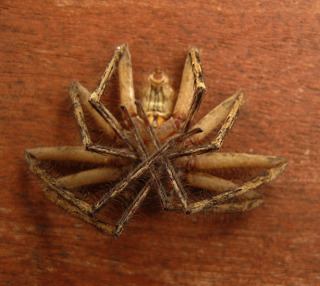 Since John's post about the garden and Cane Spider drew so much attention, we thought we would share a few of these images of one we found dead on our lanai last week. 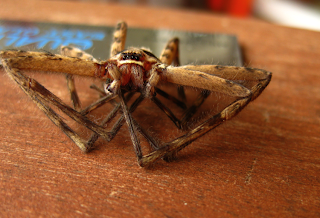 We did not kill it although it could have died as a result of the exterminator. WHAT? The exterminator is a must... otherwise we would have centipedes... to which I have spared you images of thus far. YOU DO NOT WANT TO KNOW! As you can see, this one is 1 1/2" wide with it's legs all curled under... and would be about 4 1/2" wide if totally stretched out. I never realized just how alien-like they are until looking at the zoomed in images. 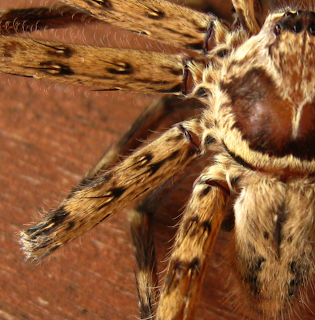 Since the spider does not have a web the egg case is carried by the mother in her mouth for up to a month, during which time she will not eat and constantly guards the precious bundle of children. I have witnessed this many times as I turn over the piles of mulch and one comes jumping out...ALWAYS MAKING ME GO PALE! We learned not to kill them as they do eat lots of other bugs. I even saw one stalking a wasp one day. 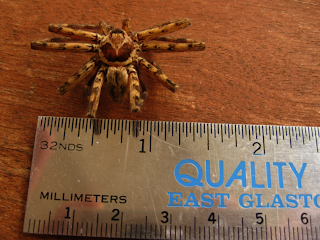 Sometimes at night we see them crawl across the window on the lanai and they always seen MUCH MUCH larger than they are... which is too big to begin with. Now who's coming for a visit? If I'm ever lucky enough to visit you guys, remind me to keep my hiking boots on (goes great with a muumuu) and to not ever go barefoot. 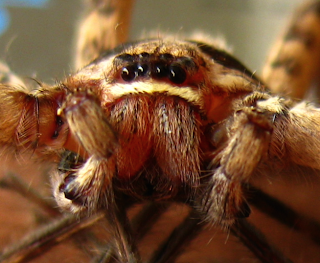 Great pix of the spider's 'face'. As they say - the eyes have it. OH... I failed to mention that I picked up a small brown bag in the shed the other day and one came flying out of it ... then scurried away. I WENT PALE. But seriously.. it's rare that we do see them. Nothing to fear... really. Come on over! There's our furry friend! I don't think I ever got this close a look before - pretty cool actually. He looks so soft and furry and almost cuddly in the last pic - heehee. Your blog usually make me homesick for Maui...this one..not so much:-) We lived in Kihei and had the exterminator over regularly and STILL had centipedes. They are so scary and painful too! Deb - I know.. the amount of fur that is on it is quite amazing. It's once we can get in and get a good close up look at them that we can somehow appreciate them better. I mean look at it! It really is quite the site and creation. As far as keeping an extra pair of tongs for the centipedes... YES! But you know, we are lucky that we rarely..knock wood.. see one in the house. And when we do... THE SHOE SLAMS DOWN ON IT! And yes... we have to shake out the shoes each and every single time we put them on. Janice - I knew I would get that reaction from most readers, but I must report on the good the bad and in this case... the ugly. At least we have no snakes... that we know of. We see an occasional centipede, but usually in the yard... and when I do I do exterminate it. In fact, the exterminator is on his way now. He comes every third Monday at 10:00 AM to lay down the "ring of fire" around and in the house. Jon... so sorry. Didn't the birds singing make up for it? Oh... I bet you saw that first. oopsie. I love how this post of all our post seems to have gotten the most response. And it has brought several readers out of the woodwork so to speak. Nice to hear from all of you. Ok so I want to move to Hawaii for the lack of snakes, my husband now is reconsidering after he saw these pictures. He doesn't like spiders. I'll miss him. the reason i moved here ... a big reason was the no snake factor. being able to be outside and tromp around without the worry of snakes sold me. i did not learn of centipedes until after we moved. they are much worse than the spiders. don't get me wrong... if either one were on me i would squeal like a stuck pig. I swear this is the most commented on post ion the history of CFC. which makes me wonder... have my previous posts been too dull? do we need a bit of this type of posting to shake things up? i did just photograph a GIANT centipede the other day and have not yet decided if i should post. i do still want friends and family yo visit.